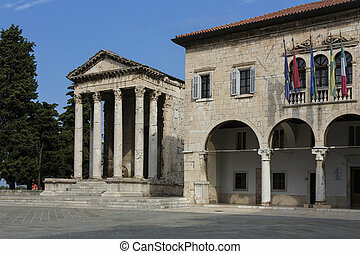 The Temple of Augustus is a well-preserved Roman temple in the city of Pula on the Istria peninsula in Croatia. Dedicated to the first Roman emperor, Augustus, it was probably built during the emperor's lifetime at some point between 2 BC and his death in AD 14. Under Byzantine rule, the temple was converted into a church, accounting for its survival to modern times, and was later used as a granary. It was struck by a bomb during an Allied air raid in 1944, almost totally destroying it, but was reconstructed in 1947. It is today used as a lapidarium to display examples of Roman sculpture. 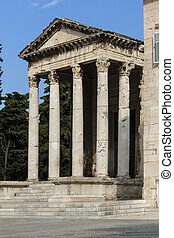 The Temple of Augustus is a well-preserved Roman temple in the city of Pula on the Istria peninsula in Croatia. 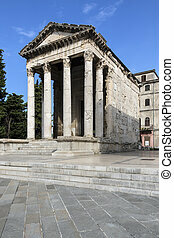 It stands next to the Town Hall and is dedicated to the first Roman emperor, Augustus, it was probably built during the emperor's lifetime at some point between 2 BC and his death in AD 14. Under Byzantine rule, the temple was converted into a church, accounting for its survival to modern times, and was later used as a granary. It was struck by a bomb during an Allied air raid in 1944, almost totally destroying it, but was reconstructed in 1947. It is today used as a lapidarium to display examples of Roman sculpture.